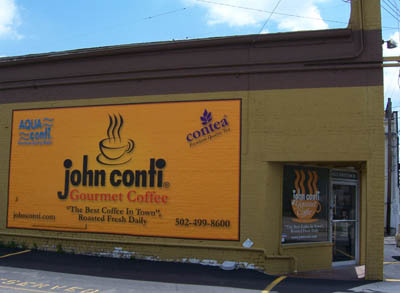 My wife and I finally made it to the John Conti (www.johnconti.com ) shop on Bardstown Road in Louisville. We have seen their coffee in local grocery stores but have never purchased it. Since we are trying to go to all of the coffee shops in Louisville and try the different coffees we decided to go there. When we got there we did not know that you couldn’t purchase brewed coffee. You can only buy whole bean or ground coffee. The salesman, Nick, we talked with was very helpful. He could give sales people a good reputation. When we told him our story about wanting to try coffee from all of the coffee shops in Louisville and write about our experiences, he went to their break room and brought us out two cups of coffee to try. That is service beyond what we expected. The coffee we tried is a light roast called Café Tarrazu. It is described as “A combination of Central American coffees specially blended to produce a sweet, balanced cup, smooth, but with a complex blend of fruit, nut, citrus, and floral flavors.” It was developed after their master roaster took a trip to El Salvador to visit coffee plantations. It is one of their most popular roasts. We ended up purchasing a bag of Café Tarrazu and two sampler packs. We intended to brew it three different ways when we got home (not in the same day of course, I couldn’t handle that much caffeine!) and then write about how it tasted. First up was the auto drip so that the coffee was ready when we got up in the morning. There isn’t much aroma and it isn’t a bold coffee. It tastes good, but we like a bolder coffee in the morning. This was our least favorite way of brewing and drinking Café Tarrazu. Next we brewed the coffee in the Chemex coffee maker (www.chemexcoffeemaker.com). You could really taste the subtle flavor of the coffee. Here is where I noticed both the flavor and fruitiness. The light crisp flavor really shined here. This was my favorite brew and tasting style. 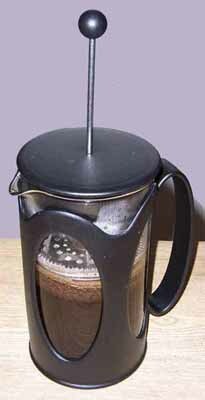 Then we brewed the coffee in a French Press. This helped the coffee taste a little bolder, but not too bold. This was my wife’s favorite style of brewing and tasting. The coffee left a nice taste on your tongue and was stronger tasting, but not overpowering. I’m neither a coffee snob nor a coffee expert, but I know what I like and if I would buy it again. I did not like drinking the coffee in the morning because I like a bolder morning coffee, but I did like it in the afternoon. We thought it has a nice crisp, taste and light body. Overall we liked Café Tarrazu and would recommend it as an afternoon or desert coffee. We will definitely try some of their other coffees, probably some medium or dark roasts though. Nick, the salesman that helped us probably doesn’t realize how much his helpfulness “sold” us. If all John Conti employees are like him, it explains why they have been successful in Louisville for so many years. You can learn more about John Conti here: www.johnconti.com . I’m also looking forward to the next coffee date with my wife. Brewing and tasting the coffees with her at home is fun too.